Article courtesy of NCWV Media - The Republican. Staff Writer: Renee Shreve. Submitted photo. Maryland Department of Transportation staff members have begun their annual tour of 23 counties and Baltimore city to update local officials and the public on the state’s six-year capital investment program. MDOT officials will meet with the Garrett County Commissioners and local residents at 10 a.m. Oct. 5 at the courthouse, 203 Fourth St., Oakland, in Room 209. The tour began in Queen Anne’s County last Tuesday and will end Nov. 15 in Baltimore County. At each stop, transportation officials will review a draft of their 2019-24 Consolidated Transportation Program and seek input on local concerns and projects. Members of the general public are also invited to express their concerns during the meetings. During the Oakland meeting, Garrett County Department of Planning and Land Management Director Deborah Carpenter will present the county’s list of priority capital projects: Major and minor transportation, safety, system preservation, sidewalk/streetscape, trails and pedestrian walkways, transit and regional transportation. 3. Friendsville Pedestrian and Bike Bridge. The U.S. 219 North Reconstruction/Relocation (requested by Garrett Trails) is the only project listed under Construction Phase. The proposed study is the county’s No. 1 planning priority. “Garrett County requests a truck corridor feasibility study to be conducted to determine if Md. 35 and Md. 495 could be improved for use as an alternative route for truck traffic,” the list notes. The No. 2 planning priority is “functional improvements” at the intersection of Md. 495 and Durst Road, where Casselman Mine is located. “Garrett County would like to partner with SHA to solve the current and forestall future problems associated with increased truck volume and size,” the county’s list states. The other intersection improvement priorities are U.S. 219 and Kings Run Road, U.S. 219 and Builders Way, Md. 135 and Sand Flat Road and Md. 135 and Turkey Neck Road. The No. 1 safety priority, as requested by Grantsville, is construction of a crosswalk on U.S. 40 at Penn Alps and the Casselman River. Trail and pedestrian priorities include construction of a pedestrian crossing at U.S. 219 and Mosser Road and evaluation of the existing pedestrian crossings at Uno’s and Trader’s Landing for safety improvements. The county’s No. 1 transportation priority is transit service expansion. “The county asks that the Maryland Transit Administration increase funding for the Garrett Transit Service fleet of vehicles in order for the system to support full-time utilization,” the list notes. The No. 2 priority is a passenger train feasibility study. “The county supports the town of Oakland in its quest for a return of passenger rail service to the Oakland Train Station,” the list states. 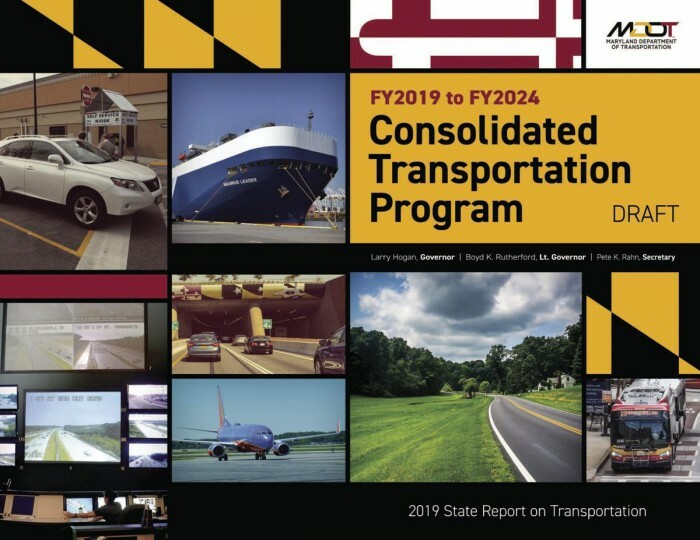 The CTP is Maryland’s six-year capital budget for transportation projects and programs across the department, including the Maryland Aviation Administration, the Motor Vehicle Administration, the Maryland Transit Administration, the Washington Metropolitan Area Transit Authority, the Maryland State Highway Administration, the Maryland Port Administration and the Maryland Transportation Authority. CTP capital projects are “generally new, expanded or significantly improved facilities or services” that may involve planning, environmental studies, design, right-of-way acquisition, construction or the purchase of essential equipment related to the facility or service. The six-year draft budget allocates $16 billion in Maryland’s transportation network, including the MAA, SHA and MVA. In addition, MTA plans to invest nearly $3.3 billion in toll roads, tunnels, bridges and preservation projects over the next six years, according to MDOT. Garrett County initiatives listed in the CTP include the upgrade and relocation of U.S. 219 North at Chestnut Ridge Road, the U.S. 219 Oakland bypass and replacement of the Hutton Road (Md. 39) Bridge over the Youghiogheny River. Also listed are sidewalk projects in Friendsville, Grantsville and Accident; milling and resurfacing at various locations in the county; resurfacing work on Md. 495; and a Md. 42 ridesharing improvement project. After their statewide tour, MDOT officials will prepare their final budget to present to the General Assembly in January. The draft CTP is available for viewing online at www.mdot.maryland.gov/newMDOT/Planning/CTP/Index.html.